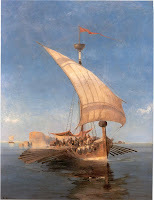 The Ship of Theseus has been a staple of philosophical discussion and teaching for millennia. The folk version of this conundrum is grandfather's axe, in which the axe in question is favoured despite having had its head and handle replaced many times. Can it be the same axe? Grandfather thinks it is, and we, the audience hearing the story, doubt that it can be. I have certainly not surveyed every instance of it, but introductions to this story always seem to take the same approach to the problem and to leave it hanging as a paradox. So why does this problem continue to fascinate philosophers? Partly, I think, philosophers like problems that can be argued over but not resolved (and their worldviews resist a resolution). However, I think it is also because the ship is a metaphor for ourselves. We visibly change over time and, at least for philosophers, this raises the question of identity. The combination of continuity and change seems to be particularly problematic for philosophers, East and West. The problem is often portrayed as having only two mutually exclusive answers with nothing to decide between: it is either the same ship or a different ship. And thus the story contains a kind of paradox. I will try to show that it is only a paradox because of the way the problem is framed and that by reframing it we can resolve the paradox. I suspect that all apparent paradoxes are related to framing problems. Over the years, philosophers have added new twists to the problem. What if we collect all the discarded old planks and build another ship out of them? Can there be two boats that we identify as Theseus’ ship? What if Theseus stays aboard the ship as it travels, but running repairs result in the same exchange of old timbers for new. Does Theseus arrive on the same ship that he set out on? And so on. All of these trade on the same framing of the problem. The framing here focusses on the relationship of the complex wholes and parts (which may themselves be simple or complex). I want to reframe the problem by pointing out that in all of the arguments about Theseus's ship, no one ever questions that the structure is a ship and no amount of plank changing alters this fact. And this gives a clue to how to deal with the question. Let us start with the idea of "ship". What are the minimal features an object must possess so that we can recognise it as belonging to the category "ship". And here I'm going to ignore the complexities of the semantics of ships versus boats and all their myriad variations. For my purposes ship here represents water-craft in a very general way. Firstly, any material that can be made watertight and is malleable can be used. One can build a ship from paper, wood, concrete, or steel. What really matters is the average density of the volume contained by the ship's hull. Any object which is less dense than water will float in it. A ship's hull encloses a large volume of space with a thin wall so that the average density of the enclosed volume is very much smaller than the density of the building material, and less than the density of water. Hence, we can build a ship from steel which is eight times denser than water, by ensuring that the hull encloses more than eight times the volume of the steel used. Thirdly, a ship needs to be hydro-dynamically efficient; i.e., it needs to move through the water easily. The best configuration for this is a hull that it is considerably longer than it is wide. A broad-beamed ship will still make way, but with considerably more effort than a long and narrow ship. A prow that converges to a point is also advantageous, though not essential. River boats often opt for a flat bottom and blunt prow, for example. A smooth surface is also advantageous. 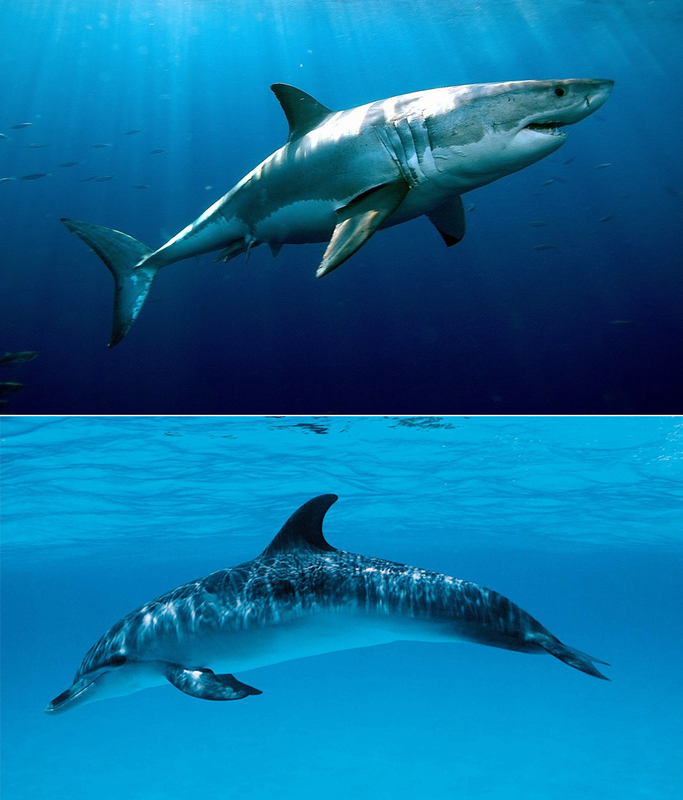 The efficiency of these criteria can be seen in the way that the evolution of aquatic animals has tended to converge on the same long, thin, pointy, smooth design. Lastly, a ship needs some kind of motive power to propel it through the water. A water-craft that is not propelled is a raft. 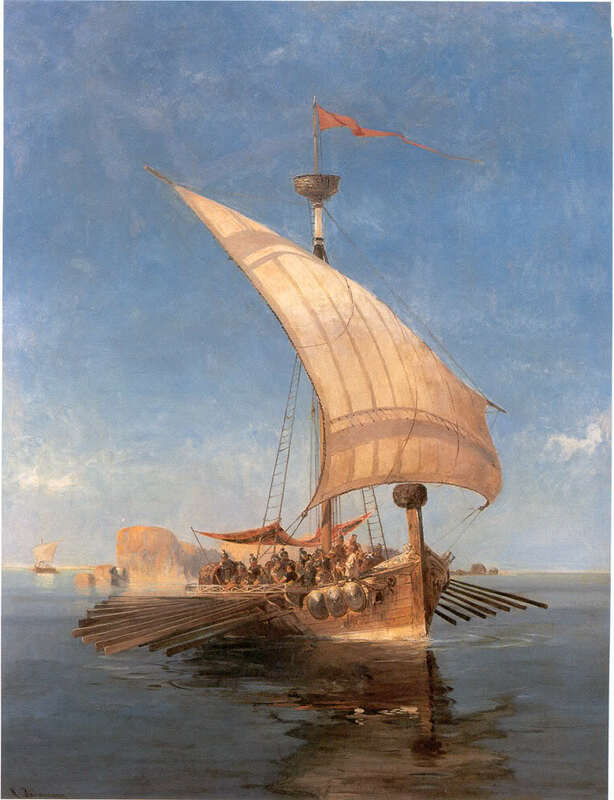 A ship can be propelled by any number of sources of power, though in ancient Greece it would have involved a combination of oars for rowing and a square or lug sail for the wind. Both methods impose constraints on the design. A mast must be stepped and stayed, and sailing requires a method to prevent leeway, for example; while oars require a fulcrum and somewhere for rowers to sit (or stand, in some designs). With just these features, an object may be called a ship. But there is something more going on here. A ship is not a ship merely because it possesses some intrinsic features. A log possesses most of these features. A ship performs a function. The function of a ship is to transport people and/or cargo over water. Note also that we can use "ship" as a verb and it is no longer confined to moving cargo by ship. As John Searle has pointed out, a function is an observer-relative feature of the object. In other words, the object we are calling a "ship" can perform the function of transporting Theseus to Minos and back, but this is not an intrinsic feature of the ship. The intrinsic features a ship has make it suitable for performing this function, but the function itself is relative to the observer. And observer- relative features of an object are created by the mental states of the observer. For example, if we take the ship out into the middle of the desert and show it to people who've never seen a large body of water, they might not be able to deduce its function from intrinsic features. They may well conclude that, rather than displacing water, the hull is designed as a cistern for storing water. And that the configuration makes it easier to drag over sand. The intrinsic features of the object alone do not tell us what function it serves for human beings. We have to have the concept of a ship in our minds, as well. Consider also someone visiting Athens who did know the story of Theseus. They might see a ship, but they would not see Theseus's ship. The connection between the ship and Theseus does not exist for them, because they haven't heard of Theseus. One might argue that Theseus exists despite his not being known about and that, even in ignorance, the ship is still Theseus's ship. However, the uninformed visitors could not discover this information through examining the ship. The ownership by Theseus is not an intrinsic property of the ship. The association with Theseus is also observer- relative. So "ship" is an observer-relative feature of an object with the appropriate intrinsic properties. Thus, a "ship" is not an ontologically objective fact. Nor is "Theseus's ship" an ontologically objective fact. The "ship" is an epistemically objective fact, but ontologically it is subjective, i.e., it only exists relative to mental states in the observer. So, in fact, the idea of "Theseus's ship" involves some intrinsic subjectivity. And part of what makes the ship interesting is the analogy of our own identity. I'm a good example because my name appears to be unique in history. There is, and has only ever been, one being called Jayarava. The fact that I am Jayarava is an ontologically subjective fact. But in my Sangha it is epistemically objective - everyone in my milieu knows that's who I am, and many do not know me by any other name (i.e., did not know me before my ordination). On the other hand, parts of me are ontologically objective. If you, literally, run into me, you'll certainly feel it. And parts of me are both ontologically and epistemically subjective, i.e., my private thoughts. So my "identity" as Jayarava spans all these possibilities (and possibly more) depending on the point of view of the observer. The identity of Theseus and of Theseus's ship both rely on a range of types of facts and this makes the problem very much more complicated. There are no simplifying assumptions we can make without excluding essential information. A ship, as I have defined it, is a combination of materials and construction. Considerable time and effort is required to turn the materials into an object with the necessary intrinsic features to perform the function of ship. The parts have to be shaped and then fixed together in ways that create the necessary structure and give it enduring integrity. However, the usual way of framing the problem of Theseus ship only looks at materials and ignores the structure itself. This may be why no one seems to notice that despite all the changes, the ship is still a ship. It seems that many philosophers are blind to the role of structure in the world. Ships are complex objects, made of many parts assembled in the right order to fit the category of 'ship'. There is a tendency to default to a reductionist paradigm in which only the parts are relevant to the question of identity. We do not see structure as real. We only see substance as real. Therefore, if we are going to invest identity in anything it ought to be, in this view, in substance. Structure is apparently incidental. If we replace one plank of wood in a ship made from dozens of planks, we have no problem in identifying the structure as the same, with a repair. If we replace all the parts, we struggle because in reductionism the parts are where identity is vested. If there are no original parts, then identity is lost. Somewhere in the middle is a cross-over point. We're not quite sure where it might be, but at some point we begin to suspect that if we replace that arbitrary number of parts, then the identity of the whole somehow changes. And this despite the fact that the ship is continually existent as a structure. This see-saw—yes/no—approach has characterised Western philosophy for years. Eastern philosophy was mired in its own problems, but clearly the Buddhist philosophy that I am familiar with also tended to reductionism and thus did no better at dealing with change. However, there is a better approach. It is better to acknowledge that the ship is both made from parts and constitutes a whole. When we analyse the ship into parts we see that parts on their own are not ships and mostly do not have the necessary intrinsic features to be a ship. The epistemically objective "ship" only emerges when we assemble all of the parts into the appropriate structure and we, the observer, have the appropriate mental states. The integrated whole has features which the the parts to not possess: especially buoyancy, hydrodynamics, and motive power. To fully understand the concept of ship we have to take into account both sides of the coin: substance and structure; as well as the observer relative status of the concept of "ship". In this view, the structure of the ship is causal. The structure causes the ship to float, to displace water, and to move in ways that parts alone cannot. The materials on their own do not have these features, or at least not enough of them to fit into the category ship. A lump of steel rapid sinks in water. But if we hollow it out so that it encloses a volume more than eight times the volume of the original lump, then it will float. Given the density of steel as a substance, we expect it always to sink. But a steel ship floats because it is ship-shaped. Here structure is more important than substance in understanding the nature of a ship. The structure also persists over time, despite the replacing of some or even all of its parts. So the structure also exists and is causal. The structure does not exist independently of its parts, but since identical parts can be substituted with no change in the structure, then structure is not absolutely dependent on its parts. Indeed, we can often remove parts from a structure and it remains intact as a structure. Removing a plank from above the water-line of a ship does not destroy the intrinsic features of the object, nor does it stop the object from performing the function of ship. Thus we can say that the structure is real. Reductionists assert that only substance is real. Antireductionists assert than only structures (or systems) are real. My view, following Richard H. Jones (2013), is that both substance and structure are real. The planks and the ship are both real, and the structure has emergent features that are not features of the planks. Planks have their own important features that enable them to function as a good building material. The individual fibres or cells of wood do not have the features of a large tree cut into planks. At every scale we look at, both substance and structure are important. However, if you dismantle a structure into its parts, the features of that structure no longer exist. So the reductionist approach to structure nets us no information because it destroys the object of interest. This is a fact every biologist is aware of. I've already pointed out that identity is an observer-relative function and not something intrinsic to insentient objects. We may project it onto objects, but in this case the identity is something we believe and someone who does not believe this will not be able to deduce it from simply interacting with the object. In this section I want to raise some other problems with how Theseus's ship is identified. Is the ship that sits in the harbour and gradually has all its parts replaced Theseus's ship? The question assumes that Theseus is a point of reference. But Theseus himself is subject to change. He ages. He sails to Minos and kills the Minotaur. How could such events not change him? Is he the same man afterwards? Well, yes and no. The structure that we think of as Theseus has been extended by having new experiences and some of the parts have been exchanged, but the fundamentals are still there. When Theseus returns, everyone recognises him as Theseus. But they probably also notice that the events at Minos have changed him as well. There is both continuity and change. Some people approach the question of the identity of Theseus's ship by ignoring the continuity and focussing on the fact of change. In this case, neither Theseus nor the ship is the same. And the difference takes on an exaggerated importance when continuity is excluded from the equation -- and some ignore the change and focus on the continuity. I can walk out my door and within a few minutes be standing on top of a large mound of dirt, piled up by the Normans in 1068 CE, which has commanding views of Cambridge and the surrounding area. The mound has been there for about 950 years as I write this. Or, on a slightly longer walk, I can visit buildings that were constructed in the 13th Century. These are structures that have persisted for centuries. Not without change and/or repair, but still, arguing that they don't exist is nonsensical. There they are, and there they have been for centuries! One has to go under, over, or around them, one cannot just pretend they are not there. For those who believe that a brick wall does not exist, the recommended procedure is to bash your head against it repeatedly, until wisdom dawns. These objects are real by any sensible definition of the word. Real and impermanent. Impermanence does not make an object unreal, it only makes it temporary. Buddhist intellectuals have struggled with this because ancient Buddhists defined existence as permanent. An impermanent object cannot be said to exist. In fact, they were mixing up experience and reality. The original target of the criticism was the existence of absolute being (ātman) in experience (pañca-skandhāḥ). Since experience is impermanent, no absolute being could be found in experience. Unfortunately, they went too far with this and equated all being with absolute being. From this, they argued that no being of any kind could be found. But this is simply a misunderstanding of an ancient criticism of ātman. Over time, structure persists. In the light of this we can say that the structure of the ship once owned by Theseus persists, helped by the exchange of rotten planks for good ones. At the same time, the substance of the ship has changed so that no plank of the original is left; but because planks are essentially identical this doesn't affect the structure. If we vest identity solely in the structure, then this is Theseus's ship. If we vest identity solely in the substance, then it is not Theseus's ship. There is no paradox here, because where we vest identity is simply an arbitrary decision we make, though probably motivated by presuppositions and non-reflective beliefs. Similarly, if we take the old planks and build a new ship, how we see it depends on whether we focus on structure or substance. The new ship is a new structure, made from old substance. So, if identity is substance ,this is the same ship and, if it is structure, it's a completely different ship. The two extremes are not the only possible answers here. Part of what philosophers do to win arguments is to back us into corners by artificially making us choose one side of a duality. This is another example of the arborescent fallacy, which sees us frame the question as having an either/or answer. In this fallacy, the world appears to us as a series of binaries. The term arborescent is also used in graph theory and botany; and was the title of an album by Ozric Tentacles. Another name for this is false dilemma. Edward de Bono independently wrote about this problem as a feature of neural networks, which he called knife-edge discrimination (1990: 108ff). After my critique of the tree metaphor in evolution (Evolution: Trees and Braids) I stumbled onto the same critique produced by Gilles Deleuze and Félix Guattari (1980), whence the name arborescent meaning 'tree-like' (from arbor 'tree' and the suffix ‑escent 'a process or state of being'). Unfortunately, having looked at their book I found it suffered from all the usual faults of French philosophy of that period: the writing style is obscurantist and the argument jumbled and poorly structured. So I still don't know what they say about the fallacy except what is on Wikipedia (so potentially I know nothing). The problem of Theseus' ship is framed according to a logical fallacy that results from a cognitive bias to see things in binary terms. Once I realised that both substance and structure were real, the problem I knew as grandfather's axe no longer seemed to me to be an either/or problem. The apparent paradox is simply a limitation artificially imposed by intellectuals who haven't fully grasped the situation they live in. They labour away with theories about how the world should be, based on idealistic or romantic fantasies. Education is a good thing, but all too often it leaves us with unexamined presuppositions that hinder our understanding. For example, most people finish their science schooling believing in reductionism and this is an obstacle to understanding because reduction is strictly limited in its application. Another complaint is that identity is a fairly slippery concept. It makes more sense to speak of a conscious entity having identity than a ship. Without a mind, the ship itself has no sense of identity. Therefore, any identity that we perceive is a quality that we have projected into the ship. Identity in this case doesn't reside in the ship at all. It resides in our own minds! What we're really wondering is whether we recognise the ship as being the same or not, which again comes down to whether we look at substance, structure, both, or neither. And I argue that we have to look at both. Since no object is entirely stable, no matter how long it persists, insisting that identity is a function of some fixed quality rather than something dynamic is just arbitrary. Castle mound is by no means exactly the same as it was ~950 years ago when it was heaped up as the base for a defensive stockade to guard a key crossing point on the River Cam. But it is a mound and there has continuously been a mound on that spot for ~950 years. A mound exists. Whether the mound exists is just something to argue about in a framework that doesn't allow a resolution. If we focus on the grains of soil, then it is not the mound, but another identically shaped mound in the same location as yesterday (by coincidence apparently). If we focus on the structure itself it is the same mound, but the parts have all changed. Answers are so often already implied by how we frame questions. Logic doesn't stop us getting things wrong. So, to recap, the problem of Theseus's ship is problematic mainly because of how it is framed and the presuppositions of the person who asks the question. Reductionist methodologies cannot cope very well with persistent structure. Reasoning from the assumptions and methods of reductionism on its own produces nonsense and/or contradictions. To understand and appreciate structure requires an antireductive approach. We have to see structures as persistent, dynamic systems, with their own (emergent) features and causal powers: e.g., buoyancy and hydrodynamism. Such a structure can function as a ship, but only in relation to other systems, such as the ocean. Also, the function of the object as a ship is an observer-relative function. While it is epistemically objective, the fact of being a "ship" is ontologically subjective. A naive observer would not look at a ship and conclude that it could convey people and cargo across the ocean, especially if they were not familiar with oceans. Identity is not vested in either parts or wholes of any inanimate object, but in our own conscious states. Any identity Theseus's ship might have is a projection from our minds onto the object. It is Theseus's ship if, and only if, we believe it to be so. Different people, at different times and places, may have different reasons for believing that it is Theseus's ship, but apart from a tiny number of long dead eye-witnesses (whose testimony may still be inaccurate), the rest of us take it on faith. If we restrict ourselves to focussing on substance and change then the ship is not the same. But if we restrict ourselves to structure and continuity then it is the same. But the dichotomy is not intrinsic. Any object we can see has both structure and substance. Both are real and therefore when considering the question of Theseus's ship, both are equally important. The problem is that we seek something essential in a complex object in which the parts are being changed for identical parts but the structure remains stable. To simply ask "Is it the same ship?" is an incomplete question. One might counter, "the same as what?" Or in other words, what is the point of comparison? If we resolve the paradox by reframing the problem and selecting appropriate methods to understand it, does it shed any new light on the problem of identity? I'm not sure that it does. We all have this experience of continuity with change. We have memories that provide us with continuity, even if they are not 100% accurate. Over a normal human lifespan change occurs rapidly at the beginning, slowly in the middle, and rapidly at the end. But we experience ourselves as continuous through our lives. Not, as some Buddhists insist, as unchanging, but as connected over time. We all understand that we change physically and mentally. Externally, we age and, internally, we accumulate experience. That there is change-with-continuity or continuity-with-change seems fairly obvious when you think about it. However, everywhere we turn this is denied. Theists argue that we have an unchanging eternal soul. Buddhists deny any kind of continuity when discussing metaphysics, but insist on continuity when discussing morality. Philosophers frame the problem of Theseus's ship so that it is a paradox. But everyday experience is of change and continuity. There is a dialectic between substance and structure and it is helpful to acknowledge the contribution of both to experience.